Year 2013 is remembered for DUO for many reasons, but one chapter that is definitely be written in big bold letters is be the one on spybaiting. Since ICast 2013, where we introduced the world to “Spybaiting – Technique of Silent Capture”, it has turned in a movement and Realis Spinbait 80/90, the vehicle for the technique, has made rounds around the world`s fisheries and magazines. The first who have given spybaiting some “love” have been great people at Bassmaster Magazine, who have went as far as gracing the cover of the September issue with the Spinbait picture. 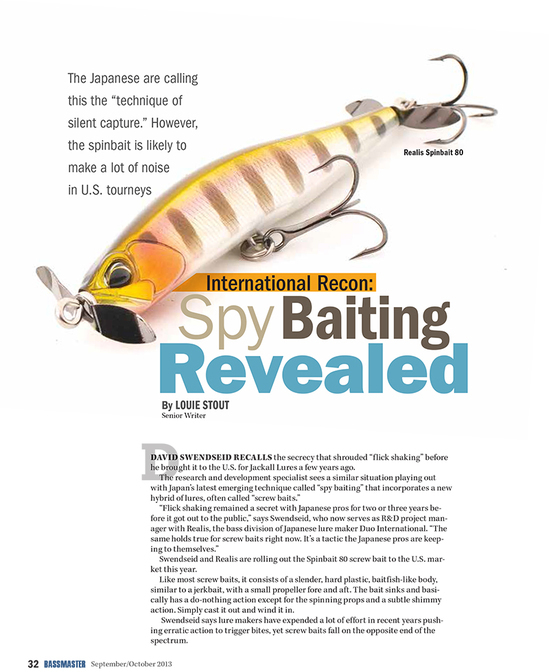 The Japanese are calling this the “technique of silent capture.” However, the spinbait is likely to make a lot of noise in U.S. tourneys. Swendseid and Realis are rolling out the Spinbait 80 screw bait to the U.S. market this year. Like most screw baits, it consists of a slender, hard plastic, baitfish-like body, similar to a jerkbait, with a small propeller fore and aft. The bait sinks and basically has a do-nothing action except for the spinning props and a subtle shimmy action. Simply cast it out and wind it in. Swendseid says lure makers have expended a lot of effort in recent years pushing erratic action to trigger bites, yet screw baits fall on the opposite end of the spectrum. Several Japanese companies also offer them, including Tiemco (Stealth Pepper 55), HMKL (K-I Mac 65), Engine (Jet Prop 65), Jackall (IProp) and Lucky Craft (Screw Pointer 95). 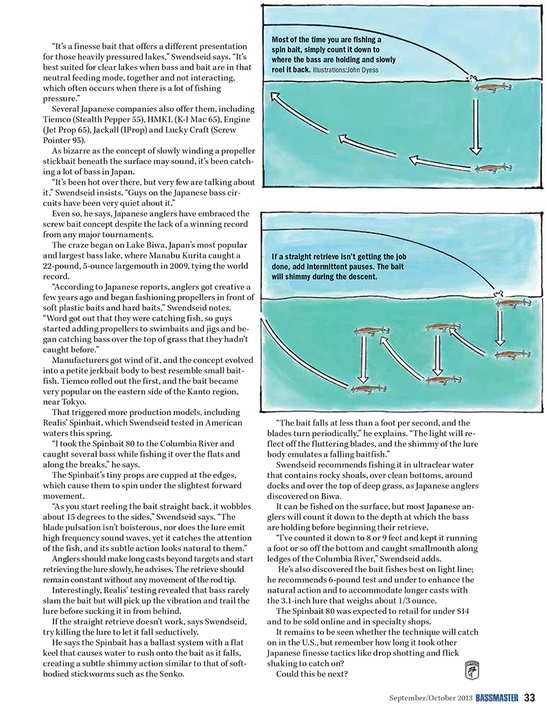 As bizarre as the concept of slowly winding a propeller stickbait beneath the surface may sound, it’s been catching a lot of bass in Japan. Even so, he says, Japanese anglers have embraced the screw bait concept despite the lack of a winning record from any major tournaments. The craze began on Lake Biwa, Japan’s most popular and largest bass lake, where Manabu Kurita caught a 22-pound, 5-ounce largemouth in 2009, tying the world record. Manufacturers got wind of it, and the concept evolved into a petite jerkbait body to best resemble small baitfish. Tiemco rolled out the first, and the bait became very popular on the eastern side of the Kanto region, near Tokyo. That triggered more production models, including Realis’ Spinbait, which Swendseid tested in American waters this spring. along the breaks,” he says. The Spinbait’s tiny props are cupped at the edges, which cause them to spin under the slightest forward movement. Anglers should make long casts beyond targets and start retrieving the lure slowly, he advises. The retrieve should remain constant without any movement of the rod tip. Interestingly, Realis’ testing revealed that bass rarely slam the bait but will pick up the vibration and trail the lure before sucking it in from behind. If the straight retrieve doesn’t work, says Swendseid, try killing the lure to let it fall seductively. He says the Spinbait has a ballast system with a flat keel that causes water to rush onto the bait as it falls, creating a subtle shimmy action similar to that of softbodied stickworms such as the Senko. are holding before beginning their retrieve. “I’ve counted it down to 8 or 9 feet and kept it running a foot or so off the bottom and caught smallmouth along ledges of the Columbia River,” Swendseid adds. He’s also discovered the bait fishes best on light line; he recommends 6-pound test and under to enhance the natural action and to accommodate longer casts with the 3.1-inch lure that weighs about 1/3 ounce. The Spinbait 80 was expected to retail for under $14 and to be sold online and in specialty shops. It remains to be seen whether the technique will catch on in the U.S., but remember how long it took other Japanese finesse tactics like drop shotting and flick shaking to catch on? 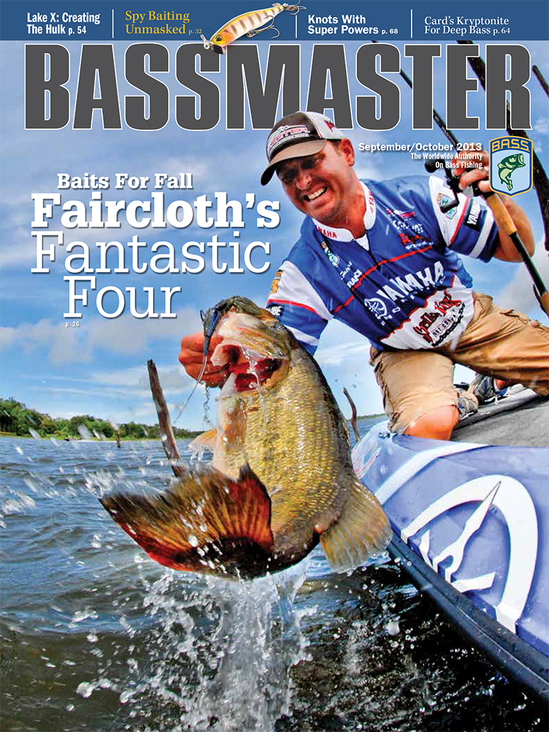 Share the post "Spybaiting Media Spotlight #1: Bassmaster Magazine"